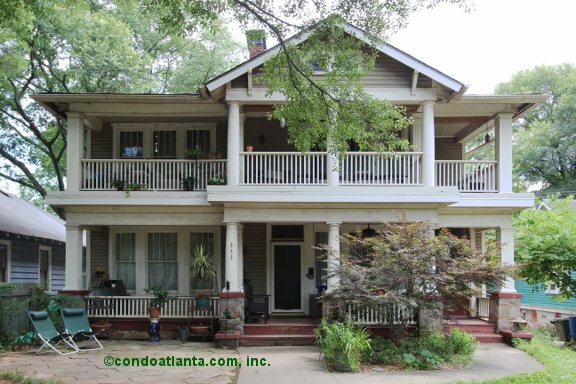 Candler Park Commons is an historic home (circa 1914) converted into a quaint condominium residences with lovely open air balconies. Candler Park Commons is a community filled with Old World Charm. Enjoy all the benefits of a home location convenient to Historic Candler Park, the Bass Recreation Center, Iverson Park, the Variety Playhouse, and the shops and restaurants of Atlanta’s L5P Little Five Points. Want to live here? We can help! For more information about available homes in this community and others, and your home search wish list, or to list your home for sale, call on us… CONDOATLANTA.com is a full service real estate brokerage. We work with home buyers and home sellers, and look forward to speaking with you. As part of your home search with us, we can set up automatic notification of new listings for the communities that interest most! Atlanta features some of the loveliest historic homes a metropolitan area could offer! Filled with all the features that give these homes the feeling of Old World Charm, Atlanta’s historic condominium communities have been created from within buildings bearing witness to the growth of the city and reminding us all of times past… Beautiful old growth trees, courtyard settings, walking distance to Atlanta’s favorite places including popular parks, the best restaurants, boutique shopping and landmark locations! Many are also listed on National Register of Historic Places!